Black and white negative of a photograph taken from the water tower on Euclid Street. 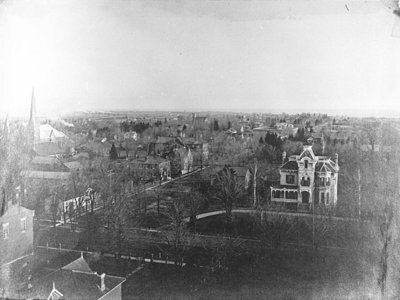 View looking south-east shows the Methodist Tabernacle (St. Mark's United Church) at left and the residence of Judge G.Y. Smith at right. This image is the third of a three-part panoramic image of Whitby. Panoramic Photograph of Whitby Part III, 1906, George I. Wilson, Whitby Archives, 22-000-003.